Price Drop! Was: $59.95 Now: $34.97. For a limited time only, while stocks last. Encourage your little musicians to learn the drums at a young age! 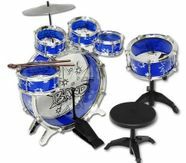 With this 6-piece Jazz Drum Play Set, kids 3 years old and above can have their own mini drum set where they can learn rocking beats and have hours of fun. The set is easy to assemble, complete with bass drum, small and large tom-toms, cymbal, foot pedal, and stool. This is a perfect entry level instrument where your young ones can practise with before getting on the real set when they get older. The play set can also help improve important skills like hand, eye, and foot coordination. Get this for your young rock stars today!